If you’re here, you’re probably a product person. You’ve studied your share of products, built them and dealt with the best and the worst of them. And now, as your business grows and billing your customers becomes more complicated, you see the appeal of a cohesive, enterprise-ready system that can plug into your own and hum away quietly in the background. You’re looking for a billing solution that addresses your comprehensive needs and comes with a level of service that simplifies its usage across your growing organization. You can build your own intelligent tools, of course, but you know it would be incredibly hard to scale and maintain. So how do you go about choosing a scalable solution? Everyone researches their options before a big buy. But strangely, when it comes to evaluating enterprise-readiness, the more we read, the more things seem muddled. There’s no clear formula for figuring out what would work best. Is it wiser to lean towards expensive solutions that promise the world or rely on industry reports to do the work? Then there’s the ground reality of working long term with the vendor you choose. It’s not just about the capabilities of the product, but the approachability of your partner. Would you want to spend a year’s worth of meetings with someone you don’t particularly like doing business with? And finally, it’s vital to understand that not all enterprises are made the same. From solutions that serve small and medium businesses who are just moving into the enterprise space to those that cater to supermassive enterprises like Salesforce and Veeva, there are several variations of what is considered ‘enterprise-ready’. It’s best to do the groundwork of determining the right fit, by finding out where you stand and if the vendor you’re evaluating has customers similar to yours. You want to be quick, accessible, and nimble, no matter your size, and that’s what you need from an enterprise-ready vendor as well. It’s important to remember that the enterprise-ready billing solution you’re evaluating needs to work a year, 5 years or maybe even 10 years down the line for your organization. You need a solution provider who can also be a partner. 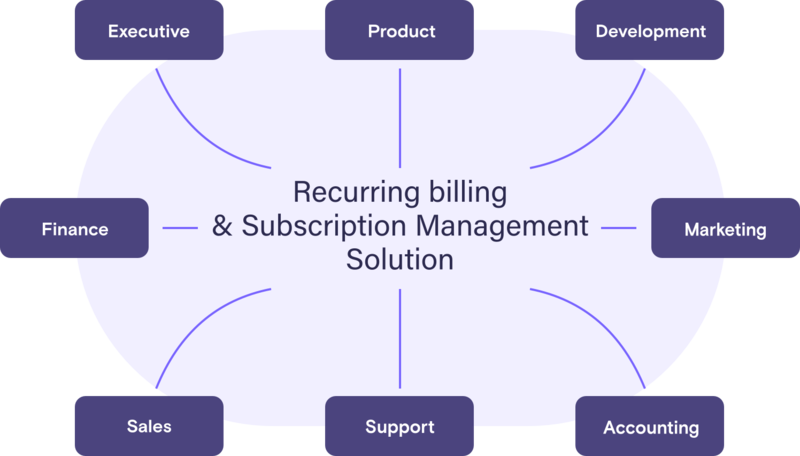 What is a recurring billing and subscription management system? Today, you can easily find checklists of enterprise-ready features on the Internet. But the intangibles of service, functionality fit, and relationship building are still the items on your agenda that will take the longest to evaluate. Which teams/departments will be using the recurring billing system within your organization? What are the functional requirements of your business and your customers? Do you have visibility into the billing provider’s product roadmap and service quality standards? Is there timely access to service and flexible support while integrating the new, external system with your own? This evaluation guide aims to guide teams in enterprises and mid-sized companies in their quest to find the best enterprise-grade billing management solution - one that passes the test when viewed from any of these perspectives. Think about every revenue-related transaction that happens within an organization and where the effects of those transactions trickle down to. Now you can see the often-unnoticed footprint of a billing management system. Executive management: Needs to ensure that a billing solution meets the business requirements of scalability, pricing model support and more. Product management: Concerned with the capability of the system to function optimally within the organization and its ability to scale with the company. Development: Requires a system that has well-built APIs that can communicate effectively with existing systems. Finance and accounting: Wants a clean, secure transfer of data between the organization and the end customer. It is imperative for them to have efficient accounting integrations and billing operations. Marketing: Needs to know how well leads are performing to bridge metrics like ROI with campaigns. They will require coupon management abilities and access to dashboards. Sales: Needs to provide discounts and automatically set up subscriptions as soon as a sale is complete. Support: Requires integrations and easy access, so they can handle billing-related enquiries quickly. Each team interacts with the billing management system for different ends, but has the common goal of reducing churn and increasing revenue. So who is this guide for? It’s most useful for executives, product managers, and department heads who are scaling an organization and recognize that the complexity and inflexibility of billing management is a growing concern blocking their way forward. They’re the ones spearheading the move towards adopting a billing solution that serves the business best. Payment collection through different payment options (credit cards, debit cards, PayPal, Amazon Payments, ACH, wire transfer, checks, cash, etc.). Unforeseen payment exceptions, nuances and edge cases can creep in with recurring billing too. At this point, the service component of a recurring billing and subscription management system take on a stronger focus. It is this indispensable layer that will help you handle billing operations gracefully, allow you to invoice your customers without complications, and get paid. Payment gateways generally process payments and generate receipts (not invoices) for payments. Billing management solutions let you do a lot more (including sending invoices), but hardly, if ever, process payments. Take Braintree, which helps thousands of businesses around the world stop worrying about how to accept payments from customers online and reduce their overheads for development resources. They simplify getting paid. But this is where most payment gateways stop - at the payments door. Braintree can handle scale at the payments level and basic billing, but enterprise-level billing management and the level of service it requires is an entirely different ball game. A billing management solution works on top of payment gateways like Braintree and Stripe to provide comprehensive subscription modules. It makes the lives of not only developers, but also project managers and the people in your finance, accounting, and marketing teams easier. But wait. What’s stopping you from building all this yourself? Together they work like a charm, but a payment gateway without a billing solution can’t accommodate the demands of a scaling organization that processes recurring payments. And without integrations with payment processors, billing management solutions can’t accept payments. This is not a simple decision to make. Although this guide makes the case for buying solutions, we understand that building them could be a good option for many businesses too. If you’re considering this question at all, you have the ability to go both ways. Your business has the bandwidth and the means to take on the building, and let’s not forget, the maintenance of an in-house recurring billing system. That means you could, if you wanted to, figure out all the complexities of accepting payments, making returns, dealing with different currencies, maintaining a system of record, integrating with other tools, handling billing-related customer communications, managing payment failures, and then building a cohesive system that takes care of everything for you. And you have the added advantage of a comprehensive knowledge of your own systems and customers. But here’s the next point to consider: What deserves your limited attention? As your organization scales in infrastructure and customer base, it’s tempting to want to get more resources and do it yourself, your way. On the plus side, you’ll have a billing system that may fit you like a glove. On the downside, you would have sunk months, if not years, into building something that’s not your core product. And even if you build it, are you ready to allocate permanent resources to the task of maintaining a billing system that’s focussed on the growing needs of teams like finance, sales, and accounting within your organization? In short, a recurring billing system is the transactional circulatory system of your organization. And especially for enterprises, the process of evaluating an external system itself can play a key role in making the decision to build and maintain, or to buy and forget. By the end of this guide, you should be able to ask yourself the same question and look at the problem differently. As businesses begin to understand the importance of maintaining a consistent system of records for all monetary transactions that happen between the customer and themselves, they begin to see the blind spots that are invisible until it’s a problem staring them in the face. For example, creating credit notes will be just as important as raising invoices. But returning money to customers and keeping track of it is not as simple as it seems at first. When your business scales, your essential infrastructure needs to scale with it, ensuring that the environment is stable, and access and security aren’t compromised. At this point, minor changes/feature requests become so entangled in the larger picture that it will no longer be possible to add functionalities and integrate them with the system with the same speed and efficiency. From the moment you create an invoice to the time when your subscriptions need troubleshooting and hand-holding, it’s best to choose a system that can manage it all at scale. Can it support subscription plans that vary based on pricing, contract length and include benefits or add-ons? Will you be able to manage trials and offer promotions/free trials for a configurable duration? Does it support recurring, everyday business operations(refunds, write-offs, manual overrides, etc) with search/sort filters for customer accounts and invoices? Does it allow you to manage coupons, discounts and promotions easily? How easy is it to take actions like re-activating or cancelling a subscription? Does the solution support customer-led account management? Most billing leaks start popping up when there’s a recurring billing model involved. You want to be able to generate recurring revenue, but are you set up to handle it? Can the billing management solution support one-time, recurring and usage-based charges? Will a single plan be able to include one or all of these charge types? Will you be able to set up a varying (weekly, monthly, quarterly) subscription payment schedule? Does it support delivery of invoices across channels like email and web? Does it provide a payment term for your customers to pay you back (NET terms)? Can the invoices be customized to include client branding? Are both invoice and line-item level manual adjustments to customer invoices supported? Does the system allow for flexibility based on fixed/customer/subscription-specific billing dates? We’ve already seen how billing management solutions may not actually process payments by themselves. But they need to do a heck of a lot to supercharge it for end customers. Does it support multiple payment providers? What is the list of payment methods it supports? Will it allow you to store and use multiple payment methods for each customer? Does it support payment method tokenization and migration? Does the system support intelligent payment gateway routing for varying scenarios (location/ invoice amount/product-based)? Does the system support fraud detection and prevention processes? Can it enable offline payments? If yes, which Direct Debit options are supported - USA-ACH, EU-SEPA? Your pricing setup is the result of weeks, months, perhaps even years of deliberation, but it still requires some leeway for experimentation as you grow. A billing management solution must empower your pricing decisions and enable change. What type of discounts, promotions or refunds does it support? Can you archive (or grandfather) product plans? What about upgrades and downgrades? Is there an easy way to configure plan switching at the end of an existing subscription contract? Does it support the setup & management of parent/child plans? Billing is as much about communication as it is about transactions. Can the solution work well with the communicators in your business? Can you use your own SMTP setup? Can the emails be customized to reflect your brand? Does the system allow for your own HTML templates? Does the system contain a sophisticated segmentation module? Can you track basic email metrics like opens and CTRs? Can you track upgrades, downgrades, and new sign ups that come in through email campaigns? Does the system handle payment failures quickly and gracefully? Is there an automated process to retry failed payments? Can the system automate in-app and email reminders for subscribers, whenever their payment methods are about to expire? Does the system support hosted and in-app payment pages that allow subscribers to update their payment information securely? Using the payment forms, can the subscribers update their billing information without logging in? Does the system support different retry cycles for soft/hard declines? Tax laws and conventions are hard to keep track of, especially if you’re operating globally. But a well-developed billing solution should be able to handle this behind the scenes, so you don’t have to. Does the system support tax-inclusive and tax-exclusive product pricing? Will the system let you apply and manage tax rules where you’re registered? Is it possible to add new countries (tax jurisdictions) and start collecting taxes? Given that tax rules are subject to constant changes across geographies, how well has the system responded to such changes in the past? Will the tax-related aspects of accounting sync up with your accounting books automatically? Are tax invoices generated in compliance with local requirements of the relevant jurisdiction? Is the system integrated with databases like VIES in the European region or ABN in the Australian region to verify the validity of the Tax IDs? Are both digital services and physical goods addressed as part of the tax configuration setup? Every team in your organization relies on accurate and reliable reports to track the health of the business. An enterprise-grade recurring billing system must have advanced analytics capabilities and the ability to generate out-of-the-box reports. No billing system works in isolation. Every touchpoint in your organization has a set of primary tools that are in regular use and the billing solution you choose must be able to integrate seamlessly with as many of them as possible. Is access to the back office controllable with configurable roles and permissions? Does the system allow user-level privileges? Is the solution able to set up data-level security for each user? Is it possible to set up action-level privileges for each user? What login security is supported by the billing system? Single sign-on? Multi-Factor Authentication (MFA)? Enterprise-level data breaches is the stuff of nightmares. While operating on the cloud gives you a host of advantages, it also increases the risk to data security. How can you ensure that your recurring billing solution is well-protected from these risks? Is the system PCI-DSS Level 1 compliant? Is the system SOC1 Type 1 compliant? Does the system undergo constant vulnerability scanning? How reliable is the billing provider’s approach to data storage? Does the solution mandate two-factor authentication for all its administrative operations? Can the billing provider explain what measures are taken to ensure network security? Enterprises and global organizations know the importance of reinventing themselves to stay relevant in different parts of the world. When it comes to billing, no two countries are the same, with differences in language, currency and payment preferences influenced by culture. So this has to be a vital part of the vetting process. Does the system support multiple payment gateways, across different regions? Does the system support multiple currencies? Does the system support multiple languages and locales? Can all geographies be managed within a single account? Your development team is going to play a big role in setting up and integrating a new solution with your business. Often their standards of measuring if a billing system is a good fit will be one of the dipsticks with which the entire evaluation process is kickstarted with a provider. Does it provide a replicate staging environment for ongoing development? What API libraries does it support? Are the API docs well-maintained, accessible and readable? Does the billing system generate and expose events? Does it provide webhooks for the events? How many webhooks can you use for your integration? Are mobile IOS and Android SDKs supported? How easy is it for your developers to learn how to use? Often, it’s not the system itself that’s a problem but the opaque processes and obscure terms and conditions enveloping it. While these factors are more intangible than a checklist of feature considerations, it can make or break a successful long-term relationship where the provider and the enterprise are mutually satisfied. The business goal of any organization looking to integrate a complex billing solution into their systems, is being able to function and grow with it while minimizing operational friction and showstopper roadblocks. For these goals to be met, there has to be visibility, collaboration and a clear understanding about what processes a billing provider has set in place and why they exist. You’ve identified a need for a billing solution in your organization for the first time, and are looking for advice on how to pick one for the long term. Ultimately, the way they work with you will be just as important as how the solution itself works. Does the company providing the solution offer dedicated support while planning for and carrying out integration with your product? Do they work hands-on with your team until the integration is complete? Do they offer specialist consultation and training as part of their ongoing service? Support in resolving reconciliation errors - will they notify you about what went wrong, what actions to take and how to handle the issue when something goes wrong with a payment? How long will the onboarding take in your case? Not all organizations are the same and the billing provider may request more information from you before giving you an estimate. In terms of pricing, time estimates and roadmaps, how well-defined and straightforward are the nitty-gritties of your contract with the billing provider? Does their pricing strategy support your growth or do they seem to have a lot of ‘fees’ that are not connected to your revenue goals? Are they transparent about their product roadmap? Do they let you know when they plan to roll out any new features you’ve requested? Are there additional charges that may come up at any time during the integration or onboarding process? If you ever choose to move on from the billing provider you are evaluating, how much support will you get? Will the billing provider give you access/export functionalities for all customer account data? If you choose to switch billing solutions, will they port sensitive data securely and map it to another provider? What happens to new sign ups on the old payment gateway while this process is underway? A sign of a mature, enterprise-ready solution provider is that they would have encountered these questions before and should be able to guide you without being confusing or vague. Also, while evaluating the time and resource costs of integrating a new system within your organization, always remember to factor in what it would cost if the solution doesn’t deliver as expected. That’s a good way to remember that what you pay upfront for the solution isn’t the only thing at stake. You may already have a full list of one-time and recurring charges for the product, integration, setup and support. But if it doesn’t help you grow and provide value, it’s a lot costlier than your calculations may initially indicate. So now that you’ve completed this guide, what next? Share it with the teams who have a stake in choosing a billing provider within your organization. There is immense value in shared knowledge and having everyone on the same page will speed things up when you begin reaching out to the billing providers who have made the cut. If you’d like to learn more, reach out to us. Chargebee has a 24x5 support team who will be happy to answer your questions, wherever you’re from.